Banana Chocolate Waffles … I mean Waffle Omelettes!! While my husband was still in Central America, our soon-to-be eight year old grandson and his 5 ½ year old brother spent the night with me in Seattle. Both had been a bit out of sorts as they were moving to a different house in a different neighborhood and thus would be switching schools and leaving old friends behind. Their dad was gone for the weekend in Montreal…there was a new au pair at their house…And then there was the election…..
And so, I figured a sleep-away at Grandma’s was the cure for tired and anxious little boys. My goal was to have them relax, not be required to ” hurry up” or be pressured by time, and to do what they wanted at my house. Pretty simple. They were both exhausted when I went to their house on Saturday, but we rallied and went out for Chinese food with Uncle Jakey Boy whose wife (!) was in the middle of a 30-hour shift at the hospital. The boys didn’t eat much and yawned their way through dinner. Next, we drove to my place and immediately they brushed their teeth, put on PJ’s and watched a short age appropriate TV program. A half hour later, they virtually begged to go to bed. NOT usual behavior. We agreed that they needed sleep and shouldn’t come out of the bedroom until eight in the morning. Zay had my glow-in-the-dark wrist watch and can tell time. Sunday morning at 6:30 AM, Zay sneaked into my room. I gave him the choice of reading or resting in my bed, and he chose reading…as always. I got my book too and both of us propped ourselves up with pillows, covered up with the down comforter and read for over an hour. Little brother Asher actually slept until eight and then joined us to snuggle for a bit. The boys then had a leisurely shower and used my grown up shampoo and hair conditioner. Next I asked the boys to come to a consensus as to what they wanted for breakfast. Choices were any variety of pancakes, waffles, eggs (Asher hates eggs), oatmeal with the fixings, granola with the fixings, or another doable option. 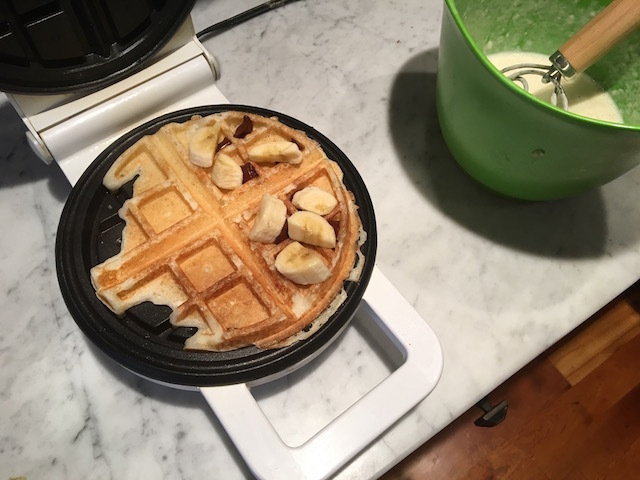 After a lot of discussion, they chose waffles “with chocolate chips and bananas and whipped cream.” I did not have cream so offered plain, full fat yogurt and they said YES. I used my pancake/waffle recipe (cut in half since it was just the three of us). Zay is in second grade and did an awesome job figuring out how to compute half of the recipe. Half of two cups is one cup, half of a teaspoon is a half teaspoon, etc. And he learned how to make buttermilk using milk and vinegar and mixed and poured himself. The kid is going to be a cook, I swear. We discussed how putting the chunks of bittersweet chocolate in the batter would be a problem in the waffle iron and could cause sticking. Zay came up with the idea of making a regular waffle, then placing chocolate pieces and banana slices on half the waffle, folding it in half and re-grilling it for 30 seconds until the chocolate melted. Genius. KA POW. 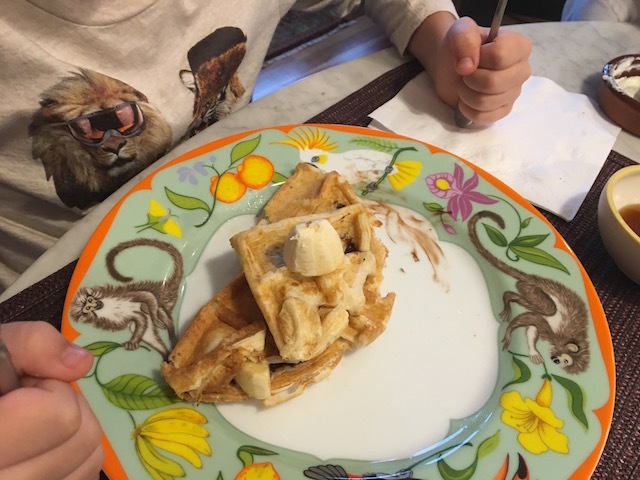 The boys named this “Waffle omelette” and the results tasted great. Most important it was a fun experience for both the boys and for me. And my daughter and granddaughter who stayed at their home got more sleep, unpacked and enjoyed a quieter house. I subbed one cup of 2% milk plus one tablespoon of white vinegar to create the cup of buttermilk. Let is sit at room temperature for about ten minutes until it starts to curdle, then it is ready. On each of the six waffles I made with half the recipe, I used about eight pieces of chocolate chunks and five or six half-moons of banana. Then I stirred some maple syrup into the plain yogurt to replace the whipping cream. This entry was posted in Breakfast and tagged banana, Chocolate, omelettes, Waffles. Bookmark the permalink.